Serious, scholarly writing and research into anomalous phenomena is a rare thing though, like a daylight UFO, it does still flash across the bows occasionally in journals and magazines like The Anomalist, Magonia (web site currently down), Fortean Times, Dark Lore (more on this soon) and of course Strange Attractor. So kudos and thanks to George Hansen, author of one of the most important fortean books of recent years, The Trickster and The Paranomal, for scanning and uploading several editions of the late Marcello Truzzi’s Zetetic Scholar. Truzzi was a sociologist with a fascination for the fringe, and his journal presents a model of how these things should be done: serious, dogma-free thinking and writing of an extremely high standard, flashed through with wry humour and a cheerful sense of the absurd. You may recognise the beginning of this quote, borrowed from the 19th century French scientist Pierre-Simon Laplace, which was also recycled by the astronomer Carl Sagan. 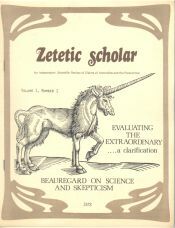 There are 13 issues of ZS online in PDF form, dating from 1978-1987, and while they make a fabulous time capsule of rejected knowledge, it’s also a little disconcerting to note that in most areas, understanding of the phenomena in question has advanced very little in the intervening years.